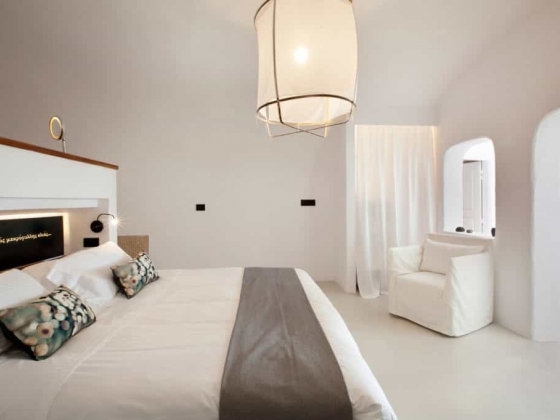 Ikies Traditional Houses is a special type of boutique hotel. 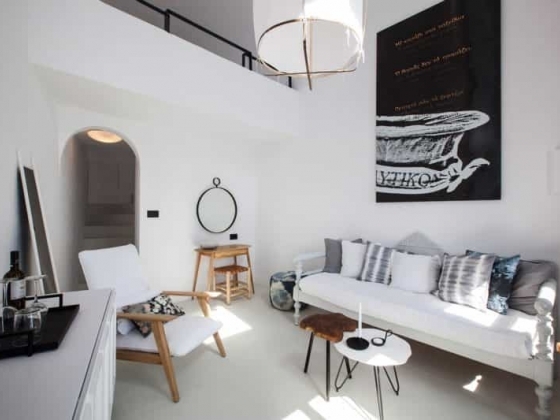 Its small size, exceptional location, traditional design, charming range of luxury accommodation and professional operation result in a rare blend of intimate and personalized service offered against a setting of unique physical beauty. 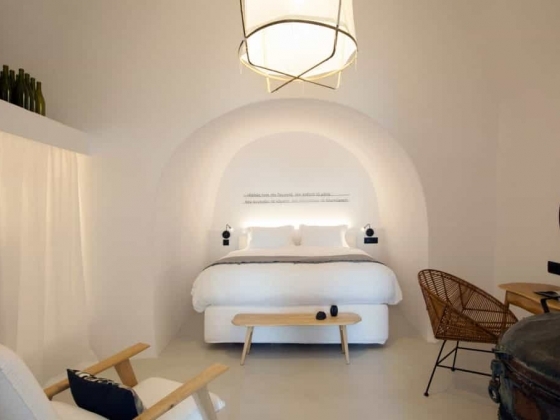 Located at the edge of the picturesque village of Oia in the northern part of Santorini Island and with commanding views over it, into the caldera and of the surrounding Cycladic islands, our guests at Ikies quickly tune themselves into the complete tranquility of the romantic village. With only a handful of rooms, service at Ikies is intimate, personalized but also discrete. 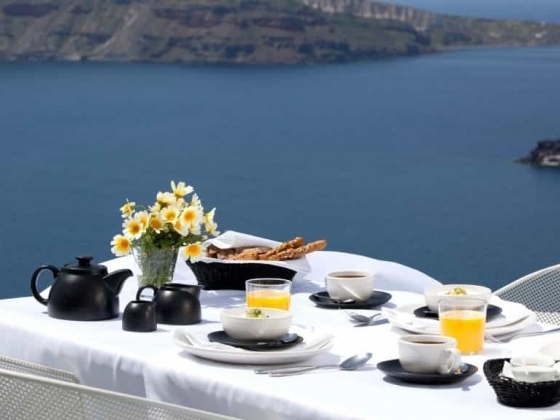 From the signature breakfast served on your personal terrace to the afternoon turndown service while you sip a sundowner, our staff's attention to your every need and desire will make you feel pampered and relaxed. 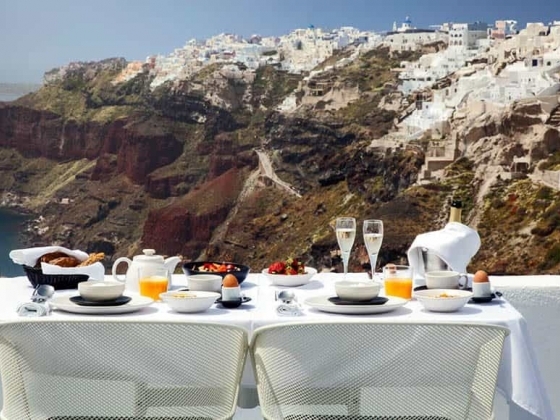 Ikies' staff will ensure that everything and anything is taken care for you: travel arrangements to and from Santorini island, organizing sight-seeing, scuba-diving or sailing excursions, special honeymoon or anniversary services packages, transportation arrangements, restaurant recommendations and reservations around Oia and Santorini. 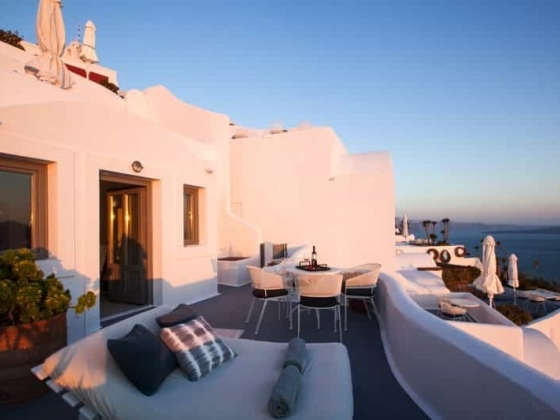 For our guests that decide to relax "at home" on their personal terrace and take in the healing Mediterranean sun we offer a light fare menu with local ingredients and simple Greek recipes as well as thirst quenching beverages and dizzying sparkling wines and cocktails. 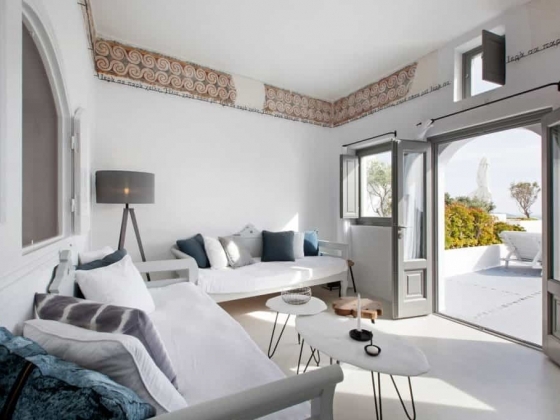 Situated at the entrance of the village of Oia, Ikies is a boutique hotel with spacious terraces and private Jacuzzis nestled in nooks and corners that offer unique views towards the caldera and the village of Oia. 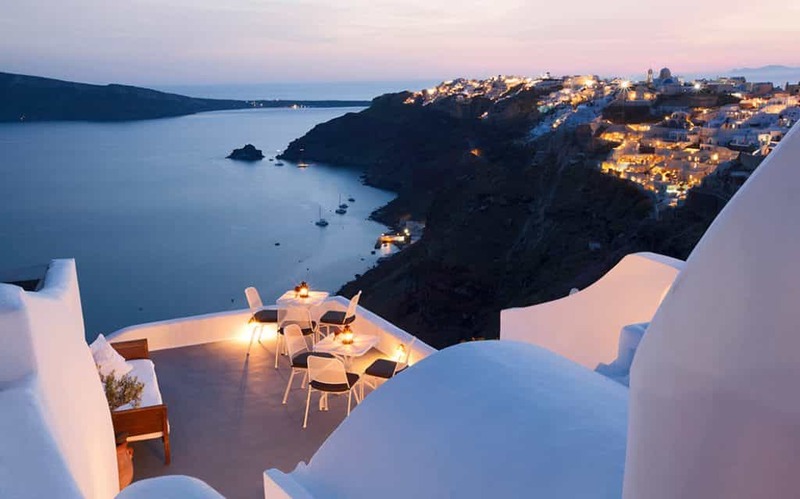 The end of each day oozes romance while the Aegean sky changes from a pristine turquoise to a medley of pink and orange hues – a lasting image to be savored from a honeymoon vacation on Santorini island. 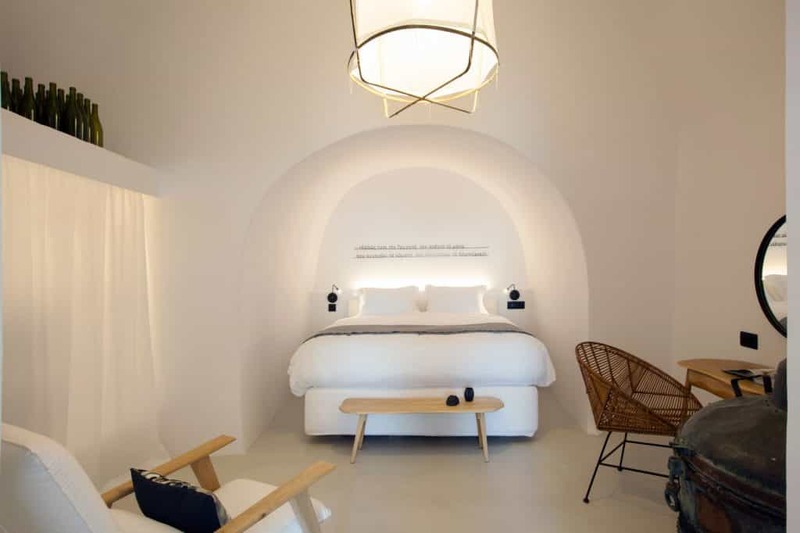 The hotel's careful ongoing renovation has resulted in a cozy balance between traditional architecture, modern facilities and luxury amenities. 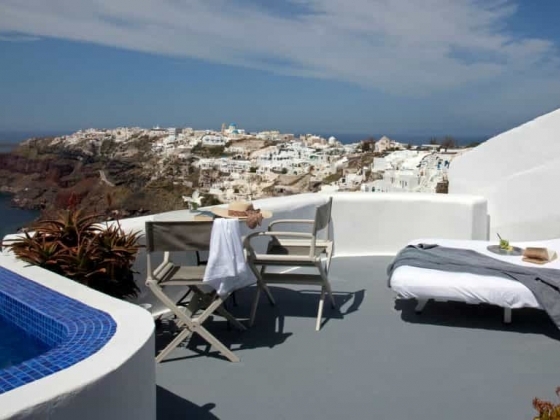 The romantic suites at Ikies are carved out of pumice into the cliffs of the caldera and boast postcard-perfect white-washed roofs, yet each house is equipped with air-conditioning, wireless internet, ipod/iphone docking station, satellite TV, and direct-dial telephone line. 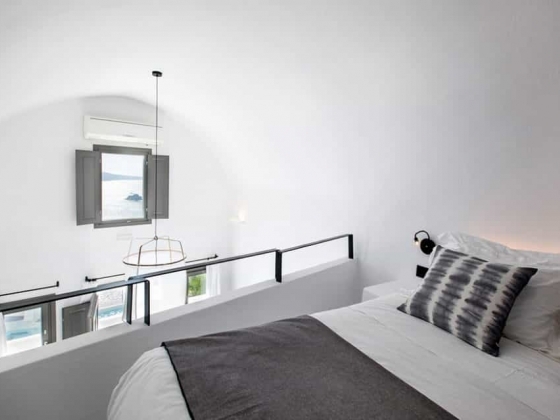 In addition, most of the houses have a private outdoor temperature controlled Jacuzzi with views to Oia and certain suites also offer a relaxing steam room. The IKIES team believes in offering honest and heartfelt hospitality and extending their genuine warmth to all our guests. 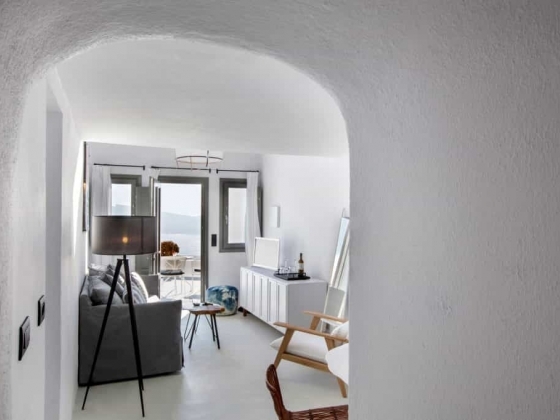 We believe in making sure your clients’ experience in Santorini and Greece is a memorable one and, to the degree that we can control it, a hassle-free one. 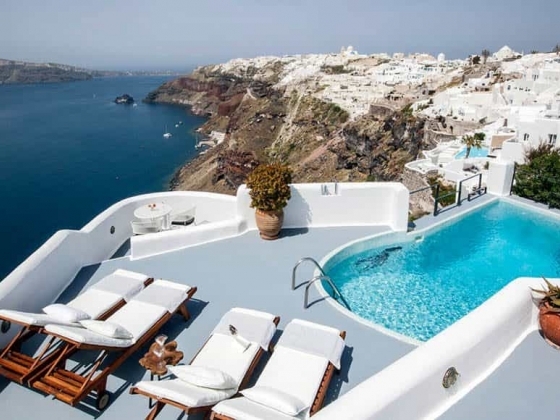 We want them to be inspired by the uniqueness of Santorini and to relax completely on their “once-in-a-lifetime” vacation or honeymoon. 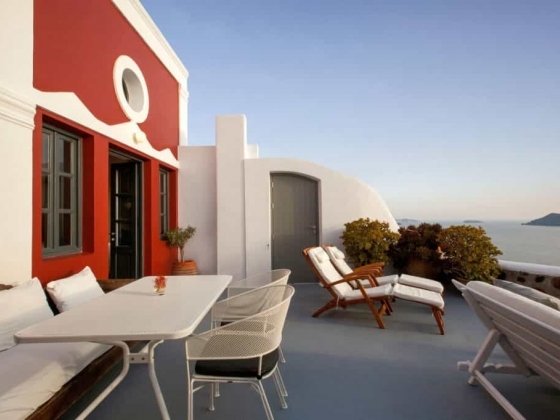 IKIES is set apart by a truly unique location that offers breathtaking views of the caldera, the village of Oia, and the sunset. The location also guarantees the least distractions possible compared to other ones in the village. Our spacious terraces are ideal for soaking up the sun and letting the day slip by with a book in one’s hand. The suites at IKIES offer the perfect setting for a romantic escape with their private outdoor hot tubs and futons, and award winning king size beds. 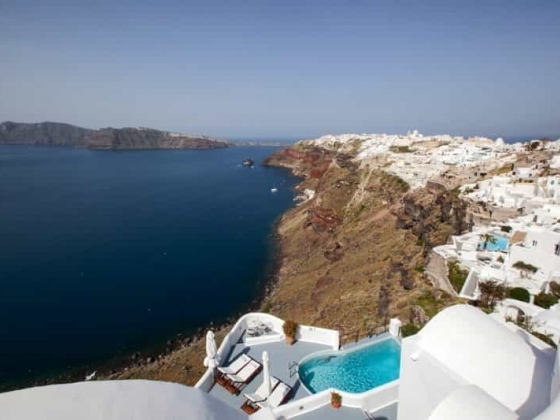 Oia is by far the most picturesque village of the island offering stunning views of the caldera, the volcano, the other villages of Santorini and of course the amazing sunset. Wandering around and getting lost in the maze like alleys of the village is a must during one’s stay on the island. It is probably the best way to find all the lovely little shops with authentic artifacts, stylish clothes and mementoes to take back home. 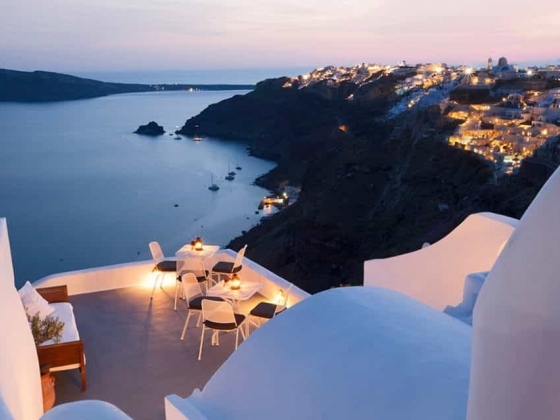 The restaurants in Oia offer a choice ranging from delicious hand wrapped souvlaki to authentic Greek taverna and from upscale French cuisine to fresh seafood restaurants. 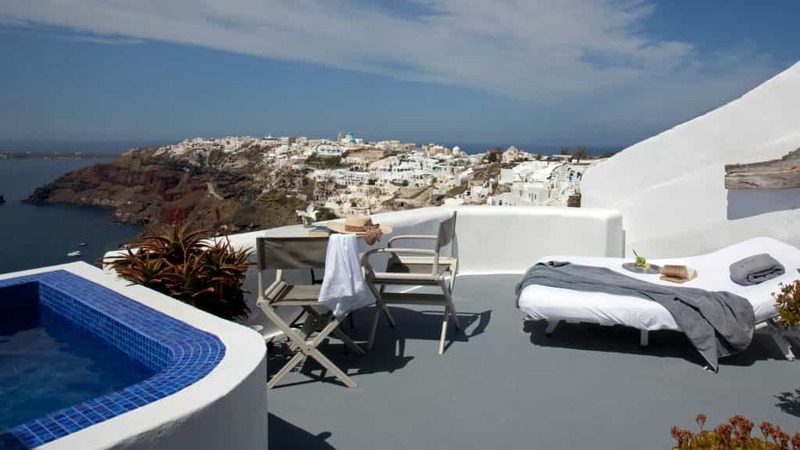 Above all, it is the atmosphere in Oia that one experiences during their stay which is hard to convey: a relaxing and idyllic feeling while gazing at the black caldera cliffs and deep blue sea below from a white washed abode. We are a young, enthusiastic and dependable team that just loves pampering our guests. We are here to ensure that your clients’ vacation is a dream-come-true!